Demonstrating deep knowledge of his interviewees' work, Brown elicits profound reflections from them as well as their considered opinions on the future of psychedelic drug medical research, God and the afterlife, LSD and mysticism, DMT research and non-human entity contact, problem-solving and psychedelics, ayahuasca and DNA, psilocybin and the religious experience, MDMA and PTSD, releasing the fear of death, the tryptamine dimension, the therapeutic potential of salvia, and the intersections between psychedelics and creativity, ecology, paranormal phenomena, and alternate realities. 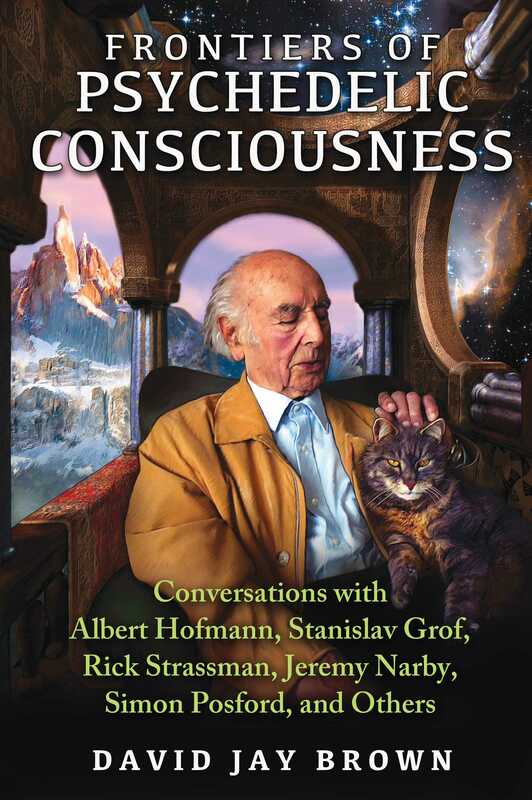 Albert Hofmann, Ph.D., is the world-renowned Swiss chemist who discovered LSD. The impact that LSD has had on the world is certainly immense, and although largely incalculable, it’s fair to say that this superpotent, mind-morphing molecule has deeply affected the foundation of every aspect of human culture--from art and science to politics, medicine, and spirituality. Hofmann was born in Baden, Switzerland, in 1906. He graduated from the University of Zürich in 1929 with a degree in chemistry and then went to work for Sandoz (now Novartis) Pharmaceutical in Basel, Switzerland. Hofmann’s research goal was to work toward the isolation of active principles in known medicinal plants. Over the next few years Hofmann worked his way through the lysergic acid derivatives in ergot. In 1938 he synthesized LSD-25 (the twenty-fifth in a series of lysergic acid derivatives) for the first time. However, after minimal testing on laboratory animals with no interesting results, he set the compound aside. Five years later, on April 16, 1943, he resynthesized LSD-25 because he felt that he might have missed something the first time around. This was at the height of World War II, shortly after Enrico Fermi made his discovery that led to the atomic bomb. Hofmann said that he had a “peculiar presentiment” to resynthesize LSD and that LSD “spoke” to him. Many people have speculated about the possibility of a relationship between the discovery of the psychoactive properties of LSD and the first nuclear explosions, because LSD is thought by many to be something of a spiritual antidote to the aggressive and toxic tendencies of the human species. After Hofmann resynthesized LSD, he wrote in his laboratory journal these famous words: “Last Friday . . . I was forced to interrupt my work in the laboratory in the middle of the afternoon and proceed home, being affected by a remarkable restlessness, combined with a slight dizziness. At home I lay down and sank into a not unpleasant intoxicated condition, characterized by an extremely stimulated imagination. Apparently Hofmann accidentally ingested a minute amount of the LSD--possibly through his fingertips--and because the drug is active in such small doses, Hofmann became the first person in human history to experience the psychedelic effects of LSD. The anniversary of that day, April 19th, has become known as “Bicycle Day,” in honor of Hofmann’s famous hallucinogenic journey through the streets of Basel on his bicycle while traveling home from the lab. Hofmann turned a hundred years old on January 11, 2006. He was remarkably healthy and acutely mentally focused when I spent time with him. I attended his centennial birthday celebration and LSD symposium--called “LSD: Problem Child and Wonder Drug”--in Basel, Switzerland, from January 13 to 15, 2006. Thousands of unusually creative and deeply appreciative people gathered from around the world to honor Hofmann’s work with the kind of reverence that is usually reserved for saints and religious sages. It was the largest conference ever held on psychedelics, and some of the most brilliant and accomplished scientists, artists, writers, and musicians on this planet were there to honor Hofmann. Hofmann passed away on April 29, 2008, at the age of 102 years old. I interviewed Hofmann with the help of my friend Dieter Hagenbach, who organized Hofmann’s centennial birthday celebration and LSD symposium in Basel. Dieter translated my questions and Hofmann’s German responses. Although Albert was feeling exhausted from the barrage of media attention around his 100th birthday celebration, he graciously agreed to answer my questions. His answers are generally brief; however, they are, I think, succinctly eloquent and profoundly wise. What originally inspired your interest in chemistry? Albert: My interest in chemistry was inspired by a fundamental philosophical question: Is the material world a manifestation of the spiritual world? I hoped to find deep, sound answers from the solid laws of chemistry to answer this question and to apply these answers to the external problems and open questions of the spiritual dimensions of life. How has your own use of LSD affected your philosophy of life? Albert: LSD showed me the inseparable interaction between the material and the spiritual world. What are your thoughts on why LSD is almost universally prohibited by governments around the world? Albert: LSD belongs to a class of psychoactive substances that provide the user with a new concept of life, and this new way of looking at life is opposite to the officially accepted view. What role do you see LSD playing in the future? Albert: In the future, I hope that LSD provides to the individual a new worldview that is in harmony with nature and its laws. Are you hopeful about the future, and how do you envision the future evolution of the human species? Albert: I am hopeful about the future evolution of the human species. I am hopeful because I have the impression that more and more human individuals are becoming conscious, and that the creative spirit, which we call “God,” speaks to us through his creation--through the endlessness of the starry sky, through the beauty and wonder of the living individuals of the plant, the animal, and the human kingdoms. We human beings are able to understand this message because we possess the divine gift of consciousness. This connects us to the universal mind and gives us divine creativity. Any means to expand our individual consciousness--by opening up and sharpening our inner and outer eyes, in order to understand the divine universal message--will help humanity to survive.